RLE is quite simple. Although, I've just discovered that it contains some hidden features: rounding, saturation and special quant table disable feature. Anyways, I am quite sure that I've figured out the exact RLE output. Ie. I am SURE that I know what exact values get passed to the IDCT section. Y-to-mono is very simple: 8bit saturation, and optional signed-to-unsigned conversion. The only special case is that the saturation bugs when the input value exceeds 9bit range. IDCT is not simple. I've spent a couple of days on running hardware tests, but I am absolutely unable to reproduce this step without rounding errors. InputMatrix is the RLE decoded data (signed 11bit values). OutputMatrix is the Y data for Y-to-Mono conversion (signed 9bit values or bigger). ScaleTableMatrix contains some signed 13bit values (which be assigned as an array of 16bit values via an MDEC command; the hardware uses only the upper 13bit of those 16bit values). And "Diagonally.Mirrored" means that matrix is multiplication is done "column-by-column" (instead of the usual row-by-column). Unfortunatley, the matrix multiplications include several multiplications, and additions. The hardware may strip fractional parts after the multiplications, and/or after ther additions, possibly stripping different amounts of bits in the TempMatrix and OutputMatrix steps, and possibly stripping some final fraction before passing the result to the Y-to-Mono section. At least in some cases, the result is rounded UP before stripping fractions. And at least in same cases, that rounding is done only if the fractions are BIGGER than 0.5. Other than that, I didn't find out anything useful, everytime that I've found a good formula for some test values... it did turn out to fail on other test values. Is there anything on the decapped chip that could help on that problems? For example, knowing the width of the multiplication results would be great! Did you already discover an MDEC section the chip? I hope there is some sort of an MDEC section (without the MDEC stuff being randomly scattered across the chip). 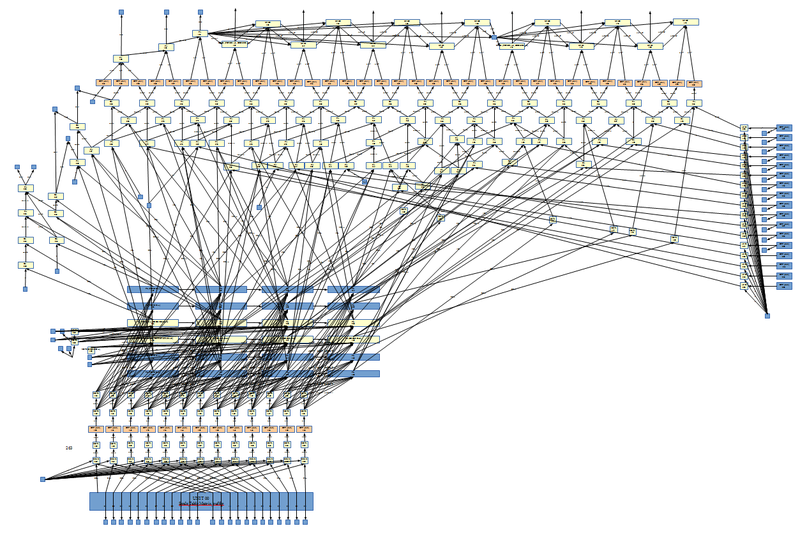 Several arrays with 64 entries (11bit rle output, 8bit quanttable, 13bit scaletable, and Nbit Y, Cr, Cb buffers). Nbit * 13bit multiplication unit for the scaletable multiplication (since it's a matrix multiplication, there might be 8 such multipliers to speed up things). "Second american decaper" should capture better quality CPU images soon, maybe things go better. We suspect that we have found an area where MDEC decoding is taking place. So the multiplier output would be... 10bits? (The arrows pointing upwards on the of the image). What are the small blue rectangles? Signals that you haven't figured out where they come from? LSB is on left of the image, right? (the .png file is a bit too small to read text in it, but I'd guess LSB=left from the wires/arrows). Is there only one multiplier? Or 8 multipliers (for multiplying a whole matrix column at once)? Just for curiosity, wouldn't matter too much if they've used parallelism or not. More important would be knowing if there's rounding in the multiplaction result and/or in the following sum-up additions. And is there a second matrix multiplier unit (for the second part of the Temp=RLE*Scaletable (first part), and then RESULT=TEMP*Scaletable (second part) multiplication)? We don't know for sure if this is really part of IDCT conversion, but it looks like it. It has 2 inputs 13bits and 11bits and has 10bits output. Scheme above updated so you can see a bit of progress. If you need i can send you original odt file. I don't see any second part or something like this. Only strange 8bit that are go from 11bits data on the right. I don't know what can this be. 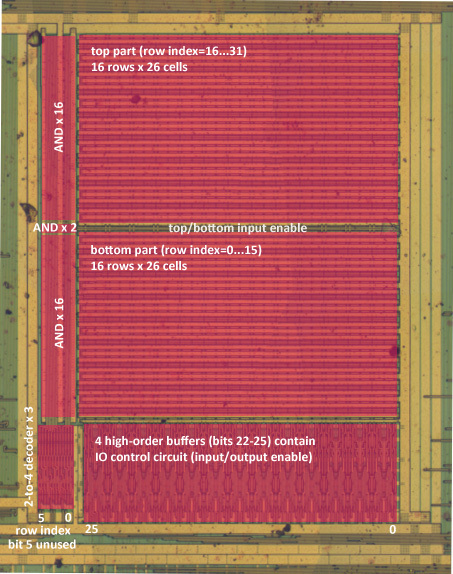 Looks right, 13bit Scaletable, 11bit RLE input in first pass. And, as it seems now, also 11bit input in second pass, and 10bit output in both passes (which is very good to know, thanks!). Only strange 8bit that are go from 11bits data on the right. I don't know what can this be. Stage 1: 11bit input from RLE unit (input to 1st matrix multiplication). Stage 2: 11bit input from Stage 1 (eight 10bit values summed together, and then somehow squeezed into 10bits) (input to 2nd matrix multiplication). Stage 3: 11bit input from Stage 2 (summed as above), and picking 8bits of the 11bit values, and passing that 8bits to the YUV-to-RGB unit (or Y-to-MONO unit) (instead of using the 11bit values as input to another, 3rd, matrix multiplication). Uhhhh. But meanwhile... you have changed the circuit picture? And it is now doing something with 13 of 17 bits (instead 8 of 11 bits)? I updated picture with lastest info (now all triggers used) - now this input has 17 bits. Bottom input still 13 bits. Left part was also updated. There are some carry calculations. I still can't understand what are bone during calculations. Some strange manipulations without strict pattern. Okay, as far as I understand, there is something for fractional bits / rounding in upper-left? The actual result seems to be only 10bits wide, but after summing up 8 values, it might become 13bit wide (yet another 13bit value). Or would it be possible that the result is bigger than 10bits, in case you haven't found all outputs yet? On the right is 17bits with something special on a 13bit portion. On the bottom is 13bits with something special on a 11bit portion. So both right & bottom inputs have some "13bit" stuff in there. Best guess might be that the bottom input can be 11bit from RLE, or 13bit from previous multiplication (eight 10bit values summed). What are think pink symbols in lower-left? If they are allowing to force the lower 2bits to zero, then they could expand the 11bit RLE values to 13bit? The input on the right side is strange. If it is the scaletable then it should be only 13bits wide. Are you sure that the 13bits on the right side are outputs, not inputs? For MDEC, I've no clue why there could be a 17bit input. Ah, unless, it's a smaller value sign-expanded to 17bits. Would that make sense? I don't understand the multiplier logic & don't know if it needs sign-expansion. Another idea would be that they might re-use the multiplier for the YUV-to-RGB conversion (which requires multiplication by some constants; though I doubt that it'd be required to 17bit resolution in that stage). EDIT: If the multiplier is re-used for different purposes - maybe the 17bit input is intended for smaller values with optional shift-amounts? Like "17bit = (13bit shl 4)" for scaletable calculation, and "17bit = whatever smaller value" for YUV calculation. That "shl 4" might be useful for getting the desired amount of fractional bits in the result, just an idea. EDIT2: What is the small blue box in lower right of the image? Does that allow to disable all inputs on right side? Or is it the sign and allows to negate (or invert) the right input? When trying to figure out the rounding, I was having the feeling that the MDEC might "negate" negative values by a "NOT" operation instead of a real "NEG" operation. 1) Scaletable matrix stored in UNIT 00. It's stored as 32 records 26 bits each. And later through multiplexer upper or lower 13 bits selected (lower part of sceme). 3) 13 bits of output is stored in UNIT 01. This is the only output of all those calculations. UNIT 01 can store 16 such outputs. 4) Other input to sceme are 6 bit of something. 5) UNIT 00 has ine more output to some other part. So scaletable matrix used somewhere else. Cool. Looks as if you are finding more details every day! Sounds fine, 64x13bit should be right (even when it's internally organized as 32x26bit for whatever reason). That feedback could be two things: Either the summing-up part (when multiplying & summing 8 entries from two matrix columns; in that case the feedback would be passed to the sum/addition hardware, not to the actual multiplier). Or, it could be the 2nd pass (when the whole matrix-by-matrix multiplication is done another time). Stores 16 outputs? Are you sure? For a matrix column it should store 8 values. And for a whole matrix it should store 64 values. That sounds a bit too less (in case you are talking about second multiplier input). Theoretically the scaletable shouldn't be used anywhere else. Unless there are two matrix multiplier units (for pass1 and pass2). Or maybe there is some test function that allows to read the scaletable content. 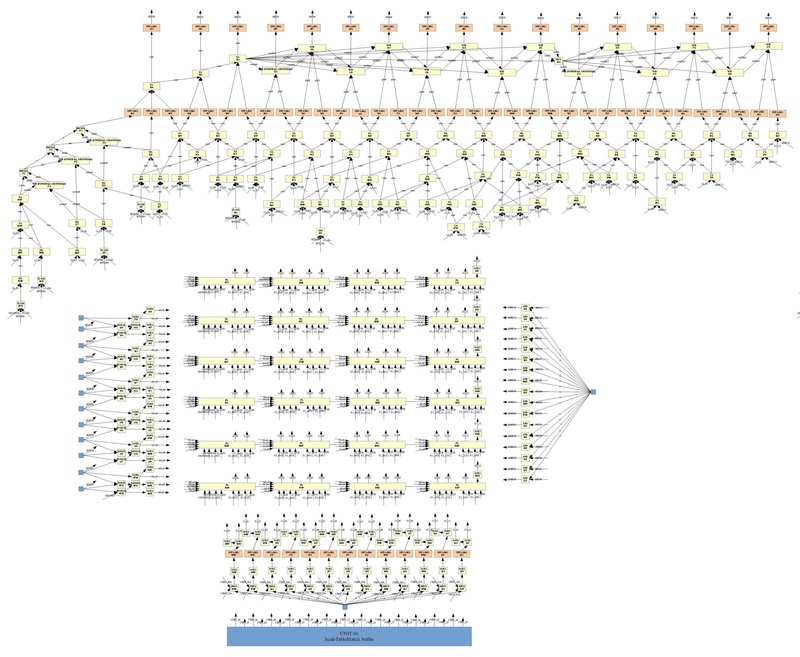 Looks like multiplication and summing with previous result is done in one pass through one network of different adders. There are two identical sum_multipliers for pass 1 and pass 2. Looks like it done matrix multiplication "column-by-column" to speedup the multiplication process. Pass 2 can be calculated in paralel as soon as first 8 sums are calculated. Not need to wait until first two matrix multiplication is completed. And it takes only 8 records with 13 bits each to store, instead of 64x13. unit 1 looks like dualport buffer. It has 16 records 13bits each. While first 8 records is used in pass2 - second 8 records are calculated. After second records calculated first 8 are not needed anymore and we can store next result here while using 2 set to pass2. - Pass 1 has 13 bit scaletable input and 12 bit of RLE input. While caculating sum - 17 bit result is used. When summing is done - only upper 13 bit of result is stored. - Pass 2 uses 13 bit of pass 1 result and upper 12 bit of scaletable matrix. While caculating sum - 17 bit result is used. When summing is done - only upper 10 bit of result is passed to next stage. I look at the next stage right now. It looks like some futher rounding is done. I see only 7 bit output. We found some circuit that makes the conversion on the output result of IDCT. It takes 10 bit as input and 8 bit as output. This is division by 2 with rounding up. Result is clamped 127, -128. Pass 2 is using only 12bit scaletable, not 13bit??? That might explain some of my rounding errors. I would have NEVER imagined that it might use only 12bits there! I am unsure which 17bits of the multiplication result are used. Theoretically, 12bit*13bit would give 25bit result. But for signed numbers it could be squeezed into 24bit (except that -800h*-1000h would overflow). And after summing up 8 values, the result might grow by factor 8, so it might be needed to be 28bits wide instead of just 25bit. If the result could be 24..28 bits wide - how many LSBs should be removed to get the 17bit value? pass 2, before multiplication: strip 1bit (to reduce scaletable from 13bit to 12bit)  ; done in these steps? Looks almost right. In my pseudo source code, I've divded the result by 2000h (=stripped 13bit) in each pass, aka stripped 26bit in total. When stripping 27bits the result would be too small... but wait, you have said that the input from RLE unit is 12bits? I was thinking that RLE output is signed 11bit. But if it's 12bit, then stripping 27bits on the final result would be just right. Though I was quite sure about RLE being 11bits, if there is an extra fractional bit, then it didn't seem to affect my hardware test results. You don't happen to see some 11bit-to-12bit expansion on the pass 1 input (ie. something that creates an extra fractional bit, or an extra sign bit)? pass 1, before multiplication: strip 1bit (to reduce scaletable from 13bit to 12bit)  ; done in these steps? I don't know if this is RLE result or some other things, but it is 12 bit for sure. And after pass 2 division by 2 - strips 2 bits (but with clamping). Overall result is 8 bit: 7 value + 1 sign. During multiplication all bits after 17 only carry is passed to next stage. You can see it in left part. Only data for upper 17 bits are go to D-triggers and futher. We don't know yet how reducing to 17 bit is working. It seems like calculation is done as sum of 8 numbers. Six of them are 13 bit of scaletable data (in 1st pass), 7th data from RLE, 8th is 17 bits of previous result. Six 13bits are formed through some calculations from 12 RLE inputs. We don't see any rounding during this calculations. Yes, yes, I already knew about that final min/max clamping (in the psx-spx doc, I did have it in the Y-to-MONO section) (and as you've found it right after IDCT pass 2, same clamping should be probably occurring right at the begin of (or prior to) the YUV-to-RGB section). I have changed my RLE code to output 12bit (one more fractional bit as in my old code with 11bits). And removed the +4 rounding in my RLE code, and removed the +0FFFh rounding in my IDCT code (so the only remaining rounding is that in the final signed-div-2 stage that you've discovered). And then I've changed my IDCT code to remove fractional bits in the various stages (as listed in my earlier post above). With qscale=0, the test results are looking almost perfect: Tested some hundreds of calculations, and got only one error (occurs when RLE=1FFh, qscale=0, scaletable=-8000h, the Y-to-MONO result should be +7Fh, but there seems to be a signoverflow somewhere that gets me -80h, I'll have to look more into that (yes, I am doing that clamping, it's only this special case where the clamping doesn't work)). Anyways, the results are MUCH better than in my earlier tests (which had around a dozen of errors). Knowing the places where to remove fractions, and knowing that scaletable is only 12bit in 2nd pass has been of great help - many thanks for that findings! I guess the hardware might drop some fractional bits after the first of the two multiplications (and of course, in that case the multiply-order would be also important; which might be different as shown above). Fixed the one error that occured with qscale=0. I was rounding up the 10bit result (+1), and then masking it to 10bit size (AND 3FFh). Which was the wrong around (value +1FFh with +1 added for rounding did exceed signed 10bits, so I should have done the masking before rounding) (as you have correctly listed it in the https://code.google.com/p/psxdev/source … ersion.txt logic table). Results for qscale=0 appear to be perfect now. I'll need to do some tests on removing fractional bits here or there in the RLE section for qscale>0. And, for colored images, the YUV-to-RGB part does still lack some details about fractions/rounding, particulary in the G=(-0.3437*B)+(-0.7143*R) and R=(1.402*R) and B=(1.772*B) calculations.